Julie’s Motel seems to have it all going on: a great location just next door to Peninsula State Park’s Fish Creek entrance, a café serving breakfast, lunch and dinner (and featuring a kids’ menu) on the premises. And within walking distance are Fish Creek shops including Founders Square area to the south and Top of the Hill shopping center to the north. In Spring 2016, Julie's concluded a massive upgrade to the property: a brand new inn! The new two story building is fantastic, offering more rooms than beofre, and totally new! Granite coutnertops, all new furnishing - spectacular! And Sande and Shane do a fabulous job making this inn a destination-stay! Renovated in 2016 into a two-story beauty! Breakfast all day, take-out box lunches, dinner specials such as homemade meatloaf on Monday, pot roast on Tuesday, all you can eat spaghetti on Wednesday, home-baked chicken Thursdays, perch and cod fry on Fridays, cherry BBQ ribs on Saturday, and Czech roast pork on Sunday. A DoorCountyNavigator.com regular dining spot! Greenspace surrounding the building; don’t miss sitting in the big purple chair! Call to make your reservation today! And tell them DoorCountyNavigator.com sent you! Best of all this is a family-friendly place with owners who are extremely sensitive to customer service and giving people value for their vacation investment. “We are here for families on a budget. We keep everything spotless and update as much as we can. We want to make sure our customers are happy 100 percent of the time,” says Shane Solomon, who has owned the motel since March 2010 with his wife, Sande. 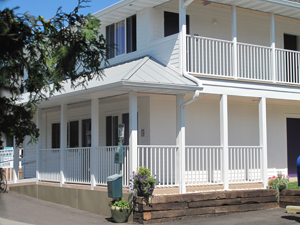 Julie’s Motel offers 22 rooms in a two-level, building, built in 2016. 7 rooms with queen bed and sofa sleeper (2 pet-friendly, and one with disability-friendly bath); 12 qith king bed and twin sleeper sofa and mini-fridge (4 pet-friendly), and 2 king whirlpool rooms, with king bed, loveseat, electric fireplace, mini-fridge, microwave, coffeemaker. The bathrooms all have granite coutnertops, as do any sideboards in the rooms. 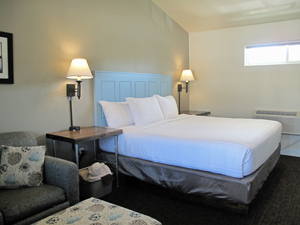 Sande and Shane have done a wonderful job really making the "new" motel both elegant and cozy. Standard amenities in all accommodations include bathrooms and seating areas. Each room alsohas a HDTV/cable with free HBO, free wireless Internet service, air conditioning, phones and a parking spot. Refrigerators are available to guests upon request. Granite countertops add to the pleasatry of the new building and new room. Julie’s Park Café operates on the same philosophy as the motel, according to Shane. Family-style, low-budget options are featured on an extensive menu. “And we cater to various needs offering gluten-free, vegan, vegetarian options,” Shane said. The restaurant features breakfast all day, take-out box lunches, outdoor dining and a pet-friendly patio. Some of the nightly dinner specials are homemade meatloaf on Monday, pot roast on Tuesday, all you can eat spaghetti on Wednesday, honey-baked chicken on Thursday, perch and cod fry on Friday, cherry BBQ ribs on Saturday and Czech roast pork on Sunday. The café sells some customer favorites: poppy seed dressing cherry BBQ sauce, strawberry rhubarb jam, cherry pie filling and even fresh baked pies. We can’t say enough about Julie’s Motel’s superb location. 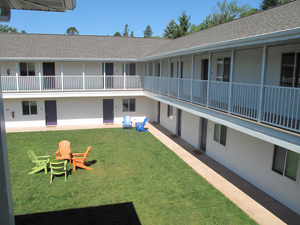 Guest will enjoy the greenspace surrounding the building and the convenience of being near Peninsula State Park, which offers abundant hiking and biking trails as well as golfing, a historic lighthouse and lookout tower, theatre performances and more. You can rent bikes nearby, too. And when you want to try different places to eat, walk to a variety of restaurants including Gibraltar Grill, Not Licked Yet and Blue Horse Bistro—all in Fish Creek. Julie’s Motel is also near Fish Creek Beach, which offers access to Green Bay water sports and is often the site for town events. But if you want to just sit around, try sitting in the big purple chair at Julie’s Motel. E-mail Julie’s Motel staff a photo of yourself sitting in the chair, and they will consider it for their online gallery (one winner a month is featured). This is a popular place, and we are delighted to include Julie’s Park Café & Motel on DoorCountyNavigator.com. Check Availability now! When you make a reservation, let them know DoorCountyNavigator.com sent you there.